'The Original UK Packaging Store' Joins Forces With Ratioform! As Davpack integrates with Ratioform, the largest packaging supplies company in Germany, we take a look at what Davpack’s staff and Customers can expect from this new, major player in the UK packaging market. Like Davpack, Ratioform was for many years very much a family business. Founded in 1979 by Thomas Krieg and his father Heinz, it operated with numerous franchised regional sales offices and grew steadily during the 1990s, establishing further outlets in Austria, Italy and Spain. Ratioform celebrated the new millennium by building an ultra-modern headquarters and central distribution facility in Landsham, on the outskirts of Munich. By 2002 the Company had firmly established itself as the number one mail order packaging supplier in Germany. In 2006, new investment and a new management structure were required as Thomas Krieg decided to withdraw from daily involvement. The long term goal was to strengthen the Company’s position through further acquisitions. 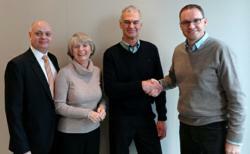 The solution was a management buyout, with financial support from Equistone Partners Europe. As part of the deal, Michael Vollmer moved up from Managing Director to Shareholder. Since 2006, Ratioform has continued to grow its online packaging materials store and has expanded further across Europe into Switzerland. During 2011, Michael Vollmer concentrated on consolidating the German operation by taking over the 8 German franchisees. Today, with around 300 staff and over 250,000 satisfied Customers, it’s a major supplier of packaging products right across the continent. Now, with the acquisition of Davpack, Ratioform also has a firm presence in the UK. When Michael Vollmer first approached Terry Davenport, Davpack’s Managing Director, with their proposal, Terry knew immediately that this was a company he could do business with. As Terry Davenport contemplates life without the company his father started 45 years ago, he is nonetheless able to do so with the confidence that he leaves it in safe hands and that his brother Paul will continue as Sales Director.